The European Union’s border agency Frontex launched a new Mediterranean operation called Themis on Thursday, removing the obligation of the previous mission to bring rescued migrants only to Italy. Italy has repeatedly lamented a lack of EU solidarity in managing immigration. The previous Frontex operation, called Triton, required all those rescued at sea to be brought to Italy even if another EU country, such as Malta, was closer. “Triton said that whomever rescued would be taken to Italy,” said Izabella Cooper, a spokeswoman for Frontex. Triton was a Greek god and the messenger of the sea, while Themis was the goddess of divine law and order. More than 1,300 migrants were rescued in 13 separate missions in the Mediterranean on Friday, bringing the total helped over the last three days to more than 2,600, the coast guard said. 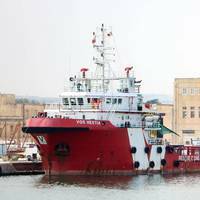 The migrants, who were aboard 13 vessels, were saved in the central Mediterranean by ships from the Italian coast guard, the Italian and British navies, merchant ships and vessels operated by non-government organisations, a statement said. Another 1,300 were rescued on Wednesday. The voyage from Libya across the Mediterranean to Italy is currently the main route to Europe for migrants. A record 181,000 made the journey last year, most on flimsy boats run by people-smugglers. More than 5,000 are believed to have died attempting the crossing in 2016. About 550 migrants, most of them from West Africa, were pulled to safety from boats in the Mediterranean on Monday in five operations during which rescuers also recovered five dead bodies, Italy's coast guard said. The bodies were in a rubber dinghy and one other person from the dinghy had drowned, according to aid group SOS Mediterranee, whose Aquarius vessel helped in the rescues off Libya's coast. "We recovered five bodies dead inside the rubber boat after the rescue, and one person drowned," an SOS Mediterranee spokeswoman said, quoting two rescue workers who said they saw the person drowning. They were not able to recover the body. A boy, who was unconscious for two hours, and a woman who had inhaled a lot of fuel, were evacuated by helicopter. The crew of a speedboat labelled "Libyan Coast Guard" attacked a migrant boat packed with some 150 migrants, beating them with sticks and causing many to fall into the water and at least four to drown, humanitarian group Sea-Watch said on Friday. Rescuers recovered three more dead bodies on a different rubber boat and picked up a total 3,300 survivors from 24 different boats during the day, Italy's coast guard said. Germany-based Sea-Watch, one of several non-governmental organisations operating vessels off the coast of Libya, said the speedboat swooped in just as they were about to go to the aid of the overcrowded rubber boat in the early hours of Friday. Rescuers pulled 301 boat migrants to safety and found five dead bodies in five operations in the central Mediterranean on Wednesday, the Italian Coast Guard said. An Irish navy ship recovered the five dead from a rubber boat along with 118 survivors. 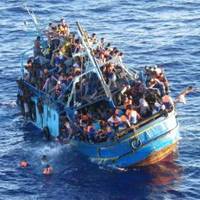 Humanitarian group Life Boat saved 130 people from another rubber boat. Overnight, Italian Coast Guard vessels rescued 18 people from a wooden boat near the southern island of Pantelleria, a further 11 near the uninhabited island of Lampione, and 24 more off the coast of Lampedusa Island on Wednesday morning. The central Mediterranean route between North Africa and Italy is the deadliest border in the world for migrants. Italy's coast guard said on Thursday it had rescued more than 300 migrants from a packed boat in which they had travelled hundreds of kilometres (miles) from Egypt to the Strait of Sicily. People fleeing war and poverty in Africa and the Middle East have been arriving in southern Italian waters for years, usually from Libya, where they pay smugglers for the passage. A spokeswoman for the Italian coast guard said migrants had arrived from Egypt in the past, but much less frequently than from Libya, which is about half as far away by boat. Italy's coast guard and a Spanish aircraft working for European Union border agency Frontex went on Wednesday to the aid of the boat, rescuing 156 men, 51 women and 107 minors. More than 900 migrants were rescued in four separate operations in the Strait of Sicily on Saturday and emergency services recovered one corpse, Italy's coast guard said. Now into the second year of its worst migration crisis since World War Two, Europe has seen more than 1.2 million people arrive since the beginning of 2015, most of them from Africa and the Middle East. Italy's coast guard has continued to pick up migrants in trouble in the stretch of water between its southern coast and North Africa, although most people seeking a better life in Europe have taken less dangerous routes to Greece. On Saturday, the Italian coast guard said it had rescued 378 migrants in two separate operations and found one body. NATO ships are on their way to the Aegean Sea to help Turkey and Greece crack down on criminal networks smuggling refugees into Europe, the alliance's top commander said on Thursday. Hours after NATO defence ministers agreed to use their maritime force in the eastern Mediterranean to help combat traffickers, Supreme Allied Commander Gen. Philip Breedlove said he was working quickly to design the mission. "We are sailing the ships in the appropriate direction," Breedlove told a news conference, and the mission plan would be refined during the time they were en route. "That's about 24 hours," he said. The plan, which was first raised only on Monday by Germany and Turkey, took NATO by surprise and is aimed at helping the continent tackle its worst migration crisis since World War Two. A boat packed with mainly African migrants bound for Italy sank off the Libyan coast on Thursday and officials said up to 200 might have died. A security official in the western town of Zuwara, from where the overcrowded boat had set off, said there had been around 400 people on board. Many appeared to have been trapped in the hold when it capsized. By late in the evening, the Libyan coast guard rescued around 201, of which 147 were brought to a detention facility for illegal migrants in Sabratha, west of Tripoli, the official said, asking not to be named. Another local official and a journalist based in Zuwara confirmed the sinking but also had no information on casualties. Rescuers found one migrant dead and saved 354 on a fishing boat in rough seas near the southwestern shore of Italy, the coast guard said on Monday. The body was found on Sunday night, adding to the weekend's Mediterranean death toll after 49 people were found dead, probably from suffocation, on an overcrowded fishing boat. 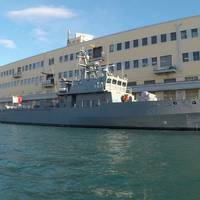 Two Italian coast guard ships, a Croatian coast guard vessel deployed under the European Union's Triton maritime mission and a merchant ship carried out the rescue in choppy waters near the coast of Calabria, the Italian coast guard said in a statement. Survivors of the weekend's tragedy were brought ashore to the Sicilian port of Catania on Monday. Island communities unable to cope with migrant flow, UN says. The United Nations refugee agency said on Friday that Greece urgently needed help to cope with 1,000 migrants arriving each day and called on the European Union (EU) to step in before the humanitarian situation deteriorates further. More than 77,000 people have arrived by sea to Greece so far this year, more than 60 percent of them Syrians, with others fleeing Afghanistan, Iraq, Eritrea and Somalia, it said. "The volatile economic situation, combined with the increasing numbers of new arrivals, is putting severe strain on small island communities," William Spindler of the U.N. High Commissioner for Refugees (UNHCR) told a briefing. Twelve migrants died on Thursday when their overcrowded rubber dinghy sank off the coast of Libya, the Italian Coast Guard said, while some 500 were rescued in the latest episodes in the Mediterranean migrant crisis. The corpses of the victims were found in the sea by the Coast Guard ship Dattilo some 40 miles north of Libya, a Coast Guard spokesman said. The Dattilo saved 106 people from the same dinghy, which was "half submerged" when help arrived. The Dattilo is still involved in other rescue operations involving boats in difficulty, the spokesman said. A total of 393 other migrants were saved in four different operations carried out by the Dattilo on Thursday. Another 106 migrants were saved by two Coast Guard frigates operating off the southern Italian island of Lampedusa.